It’s National Potato Chip Day! You can find them baked, salted, seasoned, rippled and stacked. Yes, we’re talking potato chips and it’s time to celebrate because it’s National Potato Chip Day! Make some for yourself with these fun recipes! As history goes, the potato chip was accidentally invented way back in 1853, when a chef at a resort in New York was trying to please a dinner guest. The guest complained that his french fries were too thick. The chef and guest went back and forth several times until finally, the frustrated chef made the fries so thin, the result was what we’d recognize today as a potato chip! The chips were a hit, lucky for us! We scoured the recipe pages at SheKnows for some tasty (and interesting) potato chip recipes and delightful dip recipes to go with them. We uncovered even more, shall we say, interesting recipe ideas that include potato chips. Check them out! Some people head for the salty snacks, others for the sweet. If you’re a salty snacker, you’ll definitely want to celebrate the day with a bit of a crunch! Nothing beats a classic! This recipe is for basic, fried potato chips. Nothing fancy, just a little salt (and pepper) and loads of snack-worthy goodness! This might be a little out of the ordinary when it comes to potato chipping, but give it a try! 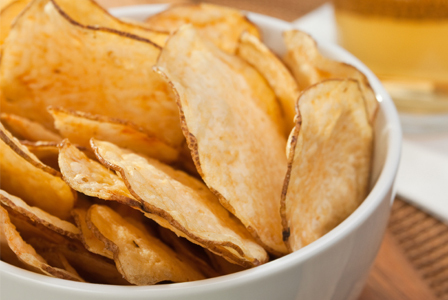 You get the best of both worlds with this sweet (potato) and salty potato chip recipe! Oh and they’re baked to keep them on the healthier side of the snacking spectrum! Potato chips in your main dish? Talk about putting two great tastes together! This recipe does it right by using chips as the chicken breading for baked crunchy goodness! This casserole includes a secret ingredient with its delicious veggie goodness. That’s right, potato chips! Seconds will be requested sooner than you think for this yummy dish! For those times when you really do want the best of both snack worlds! What could be better than chocolate chip cookies and potato chips? Try these cookies and see! Grab a napkin… and some dip! What goes hand-in-hand with chips (besides a napkin)? Great tasting dips! These dip recipes provide the crowning glory to the crispy goodness of potato chips! You won’t find this at the local convenience store! This dip recipe adds hearts of palm, garlic and spinach for your dipping delight! Who could ask for anything more? This recipe knows the stuff of tradition with its creamy goodness and touch of onion. It’s easy to make (and scoop up)! One of the best things about this dip recipe (aside from its great taste) is its versatility! Use it for salad, wings or as a dip for your favorite chip! You say po-tayto, I say delicious! Not quite potato chips, but those golden, crunchy snacks definitely provided the inspiration! These chip recipes are perfect for any party or snack-worthy event! This delightful prosciutto chips recipe makes a great garnish for salads or soups. Snacking goodness in more ways than one! Kale is so good for you and when you taste these chips, you’ll really want to eat your veggies! The possibilities seem endless! Start with one and you’ll be experimenting (and taste-testing) your way through all sorts of vegetables to make into a great (and healthier) snack! Grab a friend and sit down for the celebration! Who knew your favorite snack was so versatile?